MATERIALS BERNAT Luxor (30 yd. skeins) – 19 White (M C); 3 each Bud Green (Color A) and Vermillion (Color B) 1 aluminum crochet hook Size G OR ANY SIZE HOOK WHICH WILL GIVE THE STITCH GAUGE GIVEN BELOW 6 small Christmas bells 12 small black buttons GAUGE: 3 s c = 1 inch 3 rows s c = 1 inch RUG: Using M C, starting at centre, ch 31. Row 1: 1 s c in 2nd st from hook and in each of remaining sts, ch 1, turn- 30 s c. NOTE: Always ch 1 for turning ch. Row 2: * 1 s c in each of next 4 s c, 2 s c in next s c (inc), repeat from * across row – 6 s c increased. Row 3: * 1 s c in each of next 5 s c, 2 s c in next s c, repeat from * across row – 6 s c increased. Row 4: * 1 s c in each of next 6 s c, 2 s c in next s c, repeat from * across row – 6 s c increased. Continue in this manner to inc 6 s c EVERY ROW 22 times more, having 1 s c more before each inc on every row- 180 s c. Break off M C. Join Color A and, continuing to inc 6 s c EVERY ROW in same manner as before, work 16 rows in Color A – 276 s c. Break off Color A. Join M C and, continuing to increase in same manner as before, work 8 rows in M C – 324 s c. Break off M C. EDGING: Join Color A at beg of starting ch; working on other side of starting ch, 1 s c in each of 30 sts; continuing along edge of rug, * insert hook in end of next row, wrap yarn loosely around left forefinger twice, insert hook in these loops and draw them through st, remove finger from loops, y o and through all loops on hook (1 double loop st made), insert hook in end of next row, wrap yarn loosely around left forefinger once, insert hook in this loop and draw through st, remove finger from loop, y o and through all loops on hook (1 single loop st made), repeat from * around outer edge to beg of round. Fasten off. SANTA CLAUS: Make 6. FACE: Using M C, ch 4. Row 1: 1 s c in 2nd st from hook and in each of remaining 2 sts, ch 1, turn. Continuing in s c, inc 1 st each end of EVERY ROW 4 times. Work even for 3 rows on 11 s c, ch 1, turn. Work 1 round s c around all edges. WHISKERS: Starting at right top of face, work 1 single loop st in each s c to left top of face. Fasten off. HAT: Using M C for lower piece, ch 8. Row 1: 1 s c in 2nd st from hook and in each of remaining sts, ch 1, turn. Rows 2 and 3: Inc 1 s c each end of row, ch 1, turn – 11 s c. Rows 4 and 5: Dec 1 s c each end of row, ch 1, turn – 7 s c. Break off M C. Using Color A, work 1 round s c around piece. Fasten off. Using Color B for top of hat, ch 11. Row 1: 1 s c in 2nd st from hook and in each of remaining sts, ch 1, turn – 10 s c. Rows 2 and 3: 1 s c in each s c, ch 1, turn. Row 4: Inc 1 s c each end of row – 12 s c. Row 5: Dec 1 s c at beg of row ONLY, ch 1, turn. Row 6: Dec 1 s c at end of row, ch 1, turn – 10 s c. Rows 7, 8 and 9: Dec 1 sc each end of row, ch 1, turn – 4 sc. Row 10: Inc 1 sc at end of row, ch 1, turn – 5 s c. Rows 11 and 12: 1 s c in each s c, ch 1, turn. Row 13: Dec 1 s c each end of row, ch 1, turn. Row 14: Draw up a loop in each of 3 s c, yo and through all loops on hook. Fasten off. TASSEL: Using MC, ch 3. Work 1 double loop st in 2nd and 3rd st from hook. Fasten off. FINISHING: MOUTH: Make 6. Using Color B, ch 7. Fasten off. EYEBROWS: Make 6. Using color B, ch 6. Fasten off. Using color A, embroider 3 V sts in center of lower portion of hat. Sew eyes, eyebrows and mouths in place as shown in photograph. Using color B, embroider noses. Sew a bell to top of each hat. Sew lower portion of hat to top and sew over face, slanting top to one side. 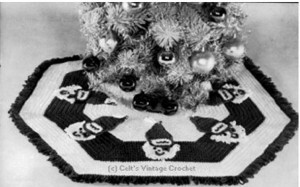 Sew one Santa to green stripe in each of the 6 portions of rug, as shown in photograph.